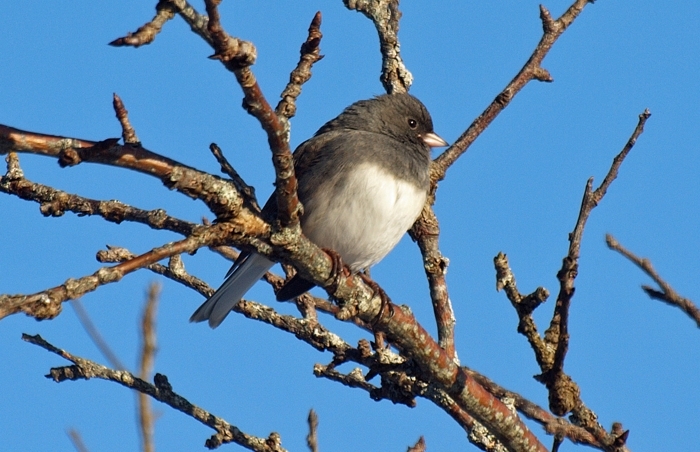 As seasons change, various creatures appear and disappear - some die; other hibernate; a few remain right where they are, and the rest migrate or shift their place of residence. Southwest Nova Scotia, with its zone 6b rating, doesn't normally get the constant heavy snowfalls common in more northerly regions. However, we do receive our share of wintry weather. January and February tend to be our coldest, snowiest months. The photos on this page include random scenes close to my home, and a few of the creatures that show up around my feeders no matter how wild it gets out there. 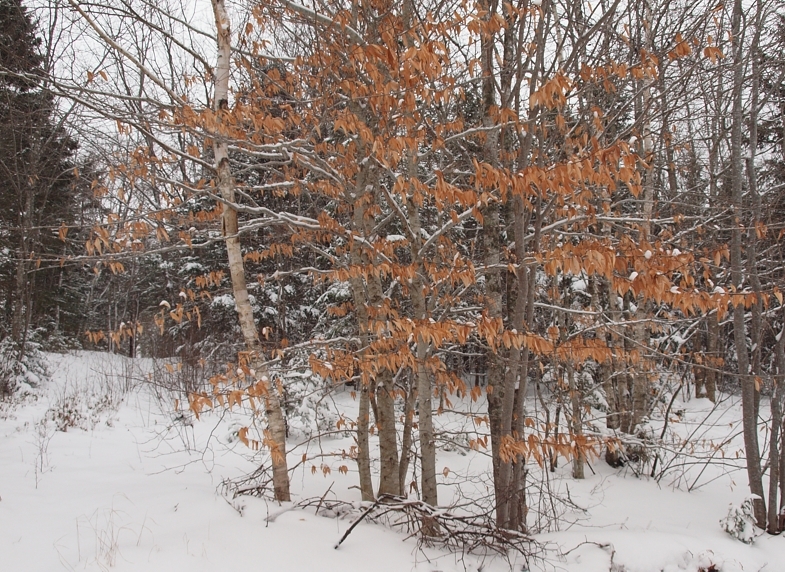 Beeches hang onto their leaves well into January if not even later. 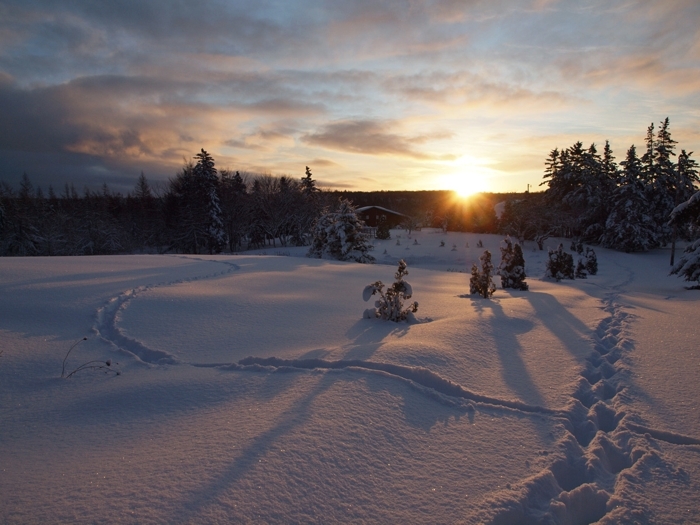 Human and deer tracks intersect on new snow at dawn. 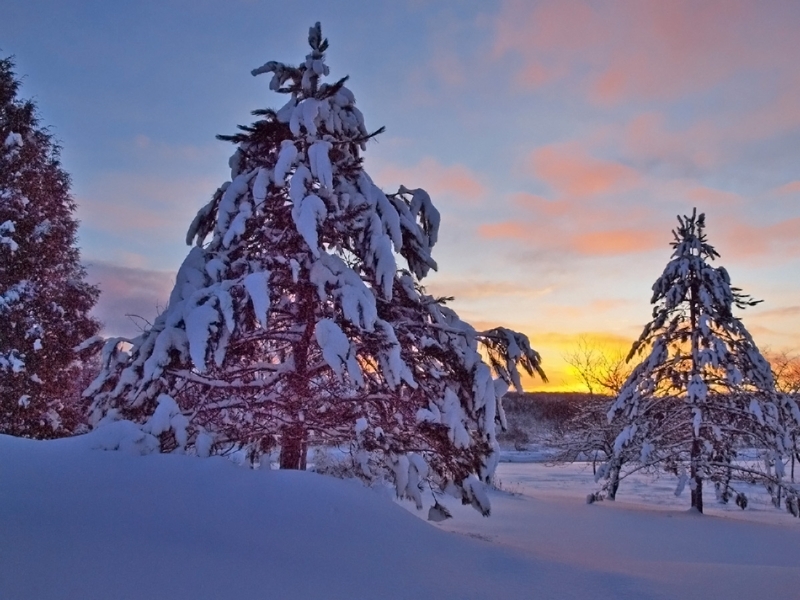 Sunrise on the morning after a major storm can be a thing of wonder. 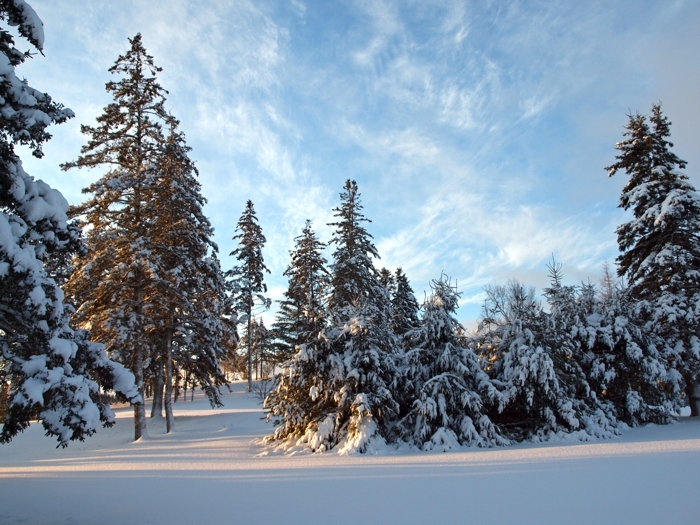 Conifers in our region provide cover for winter resident birds as well as squirrels and chipmunks. They also supply bark for porcupines and browse for deer. Various hues of blue are a lovely aspect of winter's palette. These shots were both taken shortly before sunrise. Crows brave the heavy snowfall in order to search along a river for food; a male goldfinch in winter plumage takes cover under a deck, where seed feeders have been placed. A "bluejay hotel" - an old pear tree attracts flocks of these noisy birds, where they hang out during bad weather and check out the bird feeders nearby. The winter bluejay population will eventually move out of the area and be replaced by migrant jays from elsewhere. I have never seen anything like this. 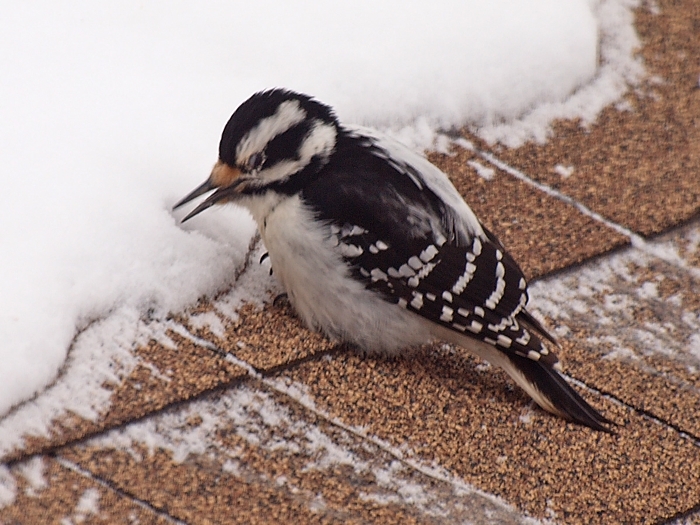 A female hairy woodpecker appears to be probing the snow on my garden shed roof, possibly to find moisture for a drink during a very cold and blustery day. 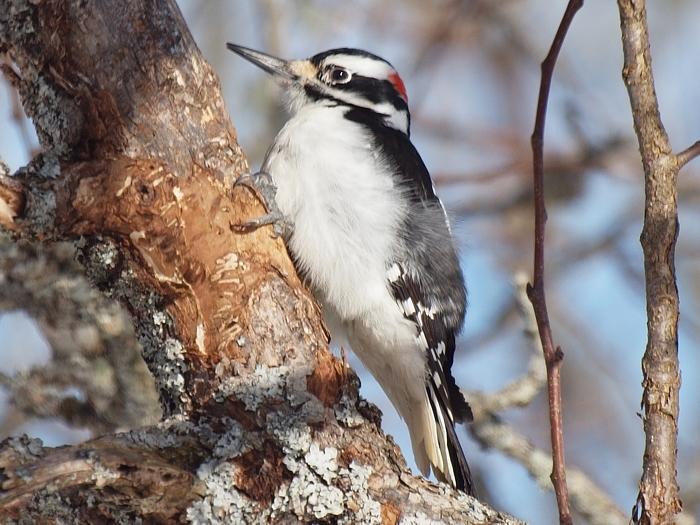 Even in the windiest of conditions, the durable hairy woodpeckers show up day after day. This one is a male. 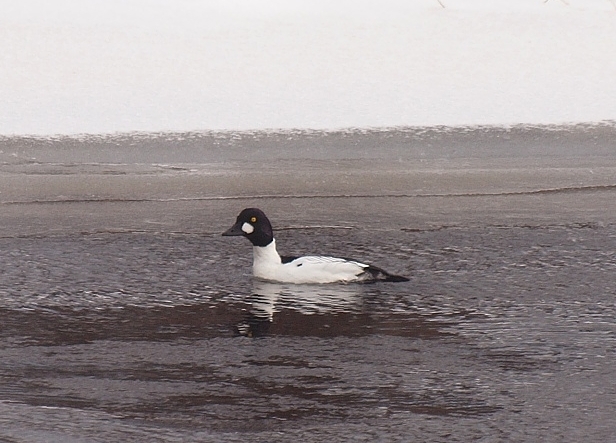 The open water is shrinking, and these three make the best of their diminishing habitat. 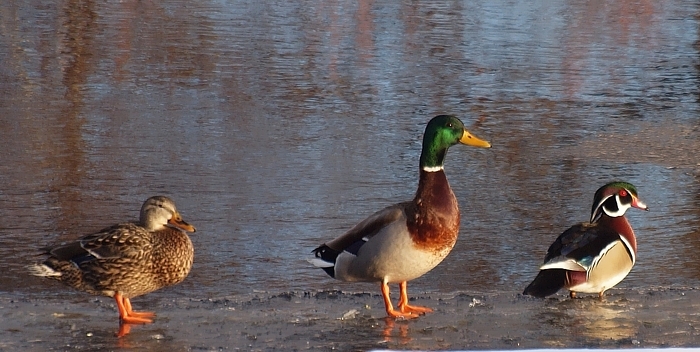 Unlike the independent bluejays, ducks depend on the availability of ice-free streams, lakes or coastal areas in order to feed. Who could resist such a delicately-hued and gorgeous sky? 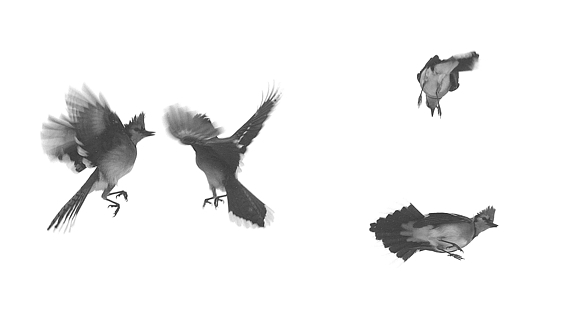 Unfortunately, even during the height of winter's challenges, these jays aren't discouraged from midair arguments. I took these shots through my window. 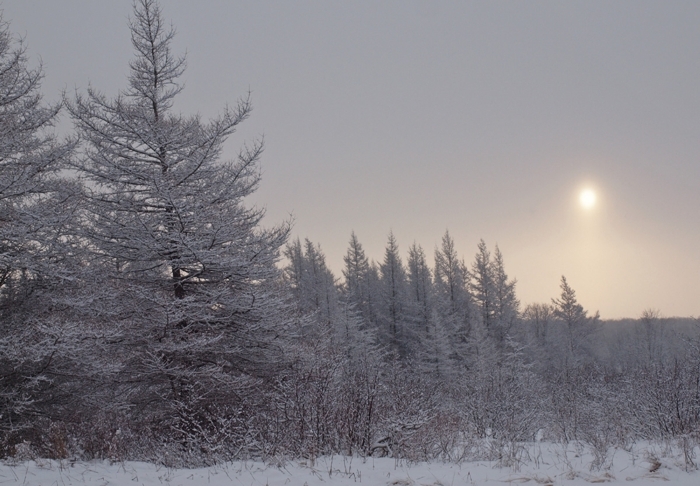 The quality of winter light is often pearl-like, soft and totally breathtaking. This is a very early morning scene.